How well do you know your neighbors? If you’re like most people, you may see your neighbors every once in a while, but they’re probably not people you would rely on if you needed help. One way you can help build community in your own neighborhood is by launching a NextDoor page. If you sign up through a referral link, you can earn a $25 Amazon gift card. NextDoor pages are like Facebook pages for your neighborhood. It’s a social network for neighbors who may or may not know each other. We started a new NextDoor page for our neighborhood when we moved to a new state. Since we didn’t know anyone, we were concerned that we wouldn’t be able to get our new neighbors to sign up for the network. But, NextDoor has a free postcard mailing service that sends information about your neighborhood’s new page to the houses you choose. It’s really easy, and it’s free! When we started our neighborhood’s NextDoor page, there was an incentive of a $25 Amazon gift card for anyone who started a new page through a referral link (there still is!). In order to claim the $25 gift card, we had to get 10 neighbors to sign up. It took a few weeks to get things going, but now our neighborhood has 42 neighbors registered on the site. We received our gift card via email a few days after our 10th new member signed up. We’ve used NextDoor to advertise yard sales, discuss issues in the neighborhood, and even ask for recommendations for babysitters. It’s a private neighborhood network, so it’s more secure than using neighborhood Facebook pages that might be seen by others. Neighbors must verify their addresses to be a part of the network. For us, it’s been a great way to get to know our neighbors and learn more about our new neighborhood. For a limited time, NextDoor is still offering the $25 Amazon gift card incentive to anyone who starts a new NextDoor site. If you start a site for your neighborhood and refer someone else who starts another qualifying site, you can earn an additional $25 gift card. It’s a great way to do something for your community and earn a little extra spending cash. How well do you know your neighbors? 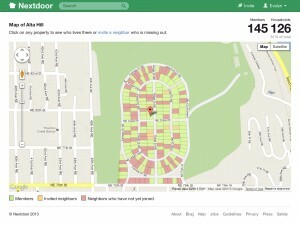 Have you started a NextDoor page for your neighborhood? That’s pretty cool! We barely know the people living next to us, and we don’t know anyone else in the neighborhood. We’ve been here a whole year and nobody ever came by when we moved in! This would be a great way to feel more connected and like we actually belonged to a community. Thanks for sharing! Hi Charlee! Yes, it’s helped us to meet people a lot. In the beginning, a lot of people posted their yard sales, so I would go to the sales and introduce myself that way. People were super friendly after learning that we had an online “connection,” and I ended up learning a lot about the neighborhood. Very cool. I have not heard of nextdoor. It sounds like a great idea. Thanks, Elizabeth! It’s been a great thing for us! Very interesting concept. Do you have any people who might feel this poses a security threat? Honestly curious. No, it’s actually more secure than a Facebook page. If someone had a serious issue with security, they probably just wouldn’t sign up.